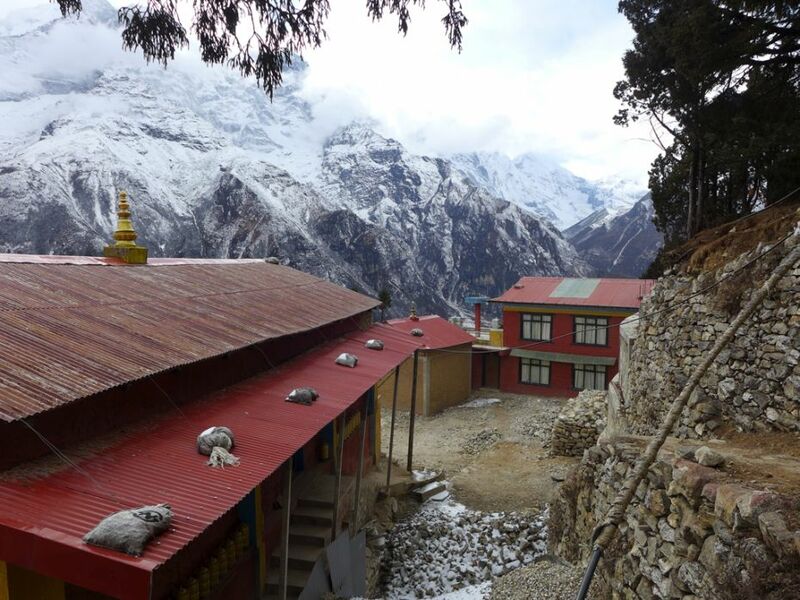 View from the Lawudo Gompa, Solu Khumbu, Nepal, January 2017. Photos by Laura Miller. Lawudo Retreat Centre, located in the Solu Khumbu district of Nepal, is where FPMT spiritual director Lama Zopa Rinpoche’s previous incarnation meditated and not far from the village where Rinpoche was born. Mandala editor Laura Miller visited Lawudo in early 2017 and shared this reflection on her experience there. 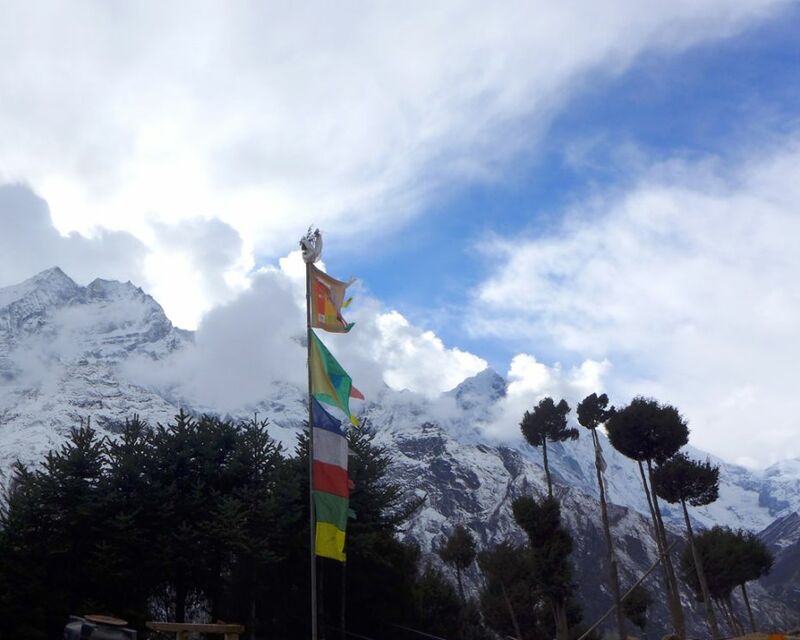 Visiting Lawudo, high in the Himalayan mountains of Nepal, had been a wish of mine for nearly eight years. And on New Year’s day 2017, my tired legs trudged up the final steep path and carried me into the yard in front of the Lawudo Gompa. Lama Zopa Rinpoche’s sister, Ani Ngawang Samten, stood there as I approached. Tears formed in my eyes when I took her hands, which seemed so soft to me despite five decades of tireless work looking after the holy retreat site. All I could say to her was how happy I was to finally be there. The previous year, my sense of personal accomplishment had sunk to a difficult low. But there I was, standing just under 13,000 feet [4,000 meters], in a place surrounded by gorgeous mountains and graced by highly accomplished practitioners. Just being there, I had achieved something that felt profoundly worthwhile and a little adventurous. Before starting my trek to Lawudo, I’d read The Lawudo Lama, an invaluable book by Ven. Jamyang Wangmo that tells the story of the inspiring lives of Lawudo Lama Kunzang Yeshe and his reincarnation Lama Zopa Rinpoche, as well as offers a detailed description of the religious and cultural history of the Mount Everest region, where Lawudo is situated. As my Sherpa guide Nursang and I walked over several days up the trail from the airstrip in Lukla to Namche Bazaar to Thame, Lama Zopa Rinpoche’s birthplace, and finally to Lawudo, the mani stones, prayer wheels, stupas, and gompas created endless opportunities for receiving blessings, rejoicing, and contemplating how generations of Sherpas, who populate the area, had made Dharma practice integral to daily life. I can date the origin of my trip back to the time when I did a little volunteer work for Mandala magazine. While working on something for the former editor, I visited the website for Lawudo Retreat Centre. The thought “I want to go there” shot directly through my mind as I scrolled through photos of the cave where the Lawudo Lama meditated and of the Lawudo Gompa and the mountains and valley that surround them. During the past six years that I’ve worked as the editor of Mandala, I’ve read and re-read stories about Lawudo: the early years when Lama Yeshe and Rinpoche visited; the young boys who became the first Kopan monks; the experiences of Westerner students who traveled there to practice; and Ani Ngawang Samten, who still keeps it all going. When the earthquake devastated Nepal in 2015, I, along with many, many others, anxiously awaited news of what happened in Lawudo. Fortunately, Lawudo survived and everyone there was OK. When my opportunity came to visit, like so many before me, I spent many happy hours in Ani-la’s smoky kitchen. I intently ate her nourishing food and listened to her first-hand stories of the early days and to her concerns about the always tenuous water supply and what will happen to Lawudo when she can no longer take care of it. That said, Ani-la didn’t seem to care much to talk about the earthquake. 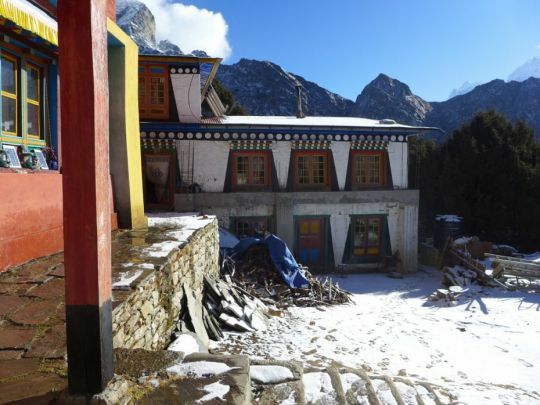 The building that contains the kitchen, dining room, and her own room, received significant damage, as did several other buildings, including the gompa and library. She lived in a tent for months while repairs were being made. During my visit, it appeared that most of the major repairs had been done thanks to generous support from the Nepal Earthquake Support Fund. The story I enjoyed most from Ani-la recounted the fraught, weeks-long effort to bring the very large Guru Rinpoche statue up to Lawudo and into the gompa. 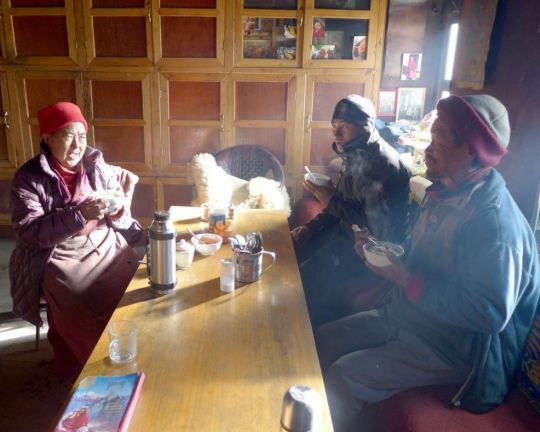 There are no roads in the upper Solu Khumbu district. Humans and yaks carry all nature of things in this remote area; helicopters bring in larger goods and shipments. 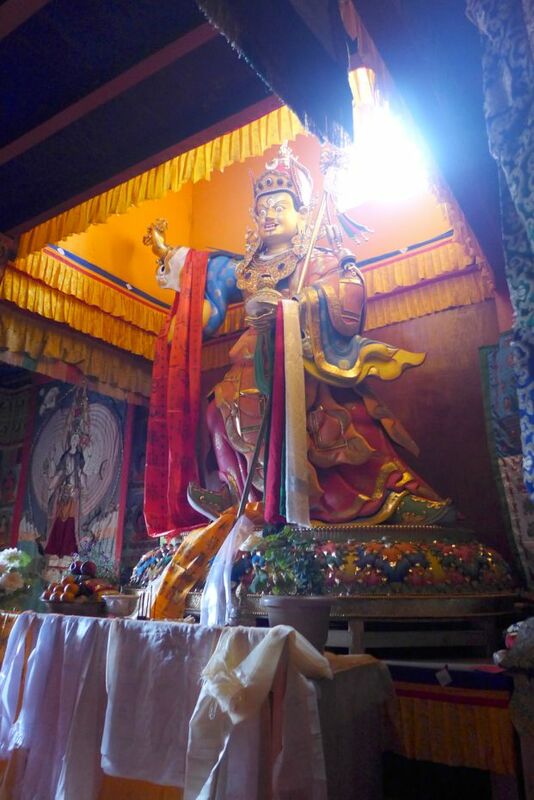 The beautiful Guru Rinpoche statue stands 13.5 feet [14 meters] tall, far too large to be carried very far. In fact, it is so tall that part of the ceiling of the gompa had to be removed in order for it to fit. My retelling of Ani-la’s story wouldn’t do it justice, but her account covered a succession of false starts, involving a very big helicopter, bad weather, drunken pilots, and the statue being stuck inside the helicopter until it wasn’t. The story ended with an auspicious rainbow surrounding the helicopter on its arrival at Mende, just below Lawudo, and the two dozen Sherpas who carried the precious holy object up the steep hill and into the gompa. The Padmasambhava Project for Peace covered the cost of inviting this impressive statue to Lawudo as well as its creation and that of nine other smaller statues of Guru Rinpoche that are now in the Lawudo Gompa. My visit to Lawudo was short, just a taste. I had one afternoon to meditate in the Lawudo Lama’s cave. But like receiving even a short Dharma teaching from a Buddhist master, that experience had a deep and lasting effect. Thinking about it now, the dollars spent, the hard work of the hike up, the rough accommodations, and the misgivings about the elevation and the state of my body all seem so minuscule when I compare them to simply being able to be in that cave. I hope and dedicate that anyone else who wishes to go to Lawudo be able to do so and that I am able to return. I rejoice and am grateful for all who have supported the Lawudo Retreat Centre over the years and pray that it may continue on for a very long time. 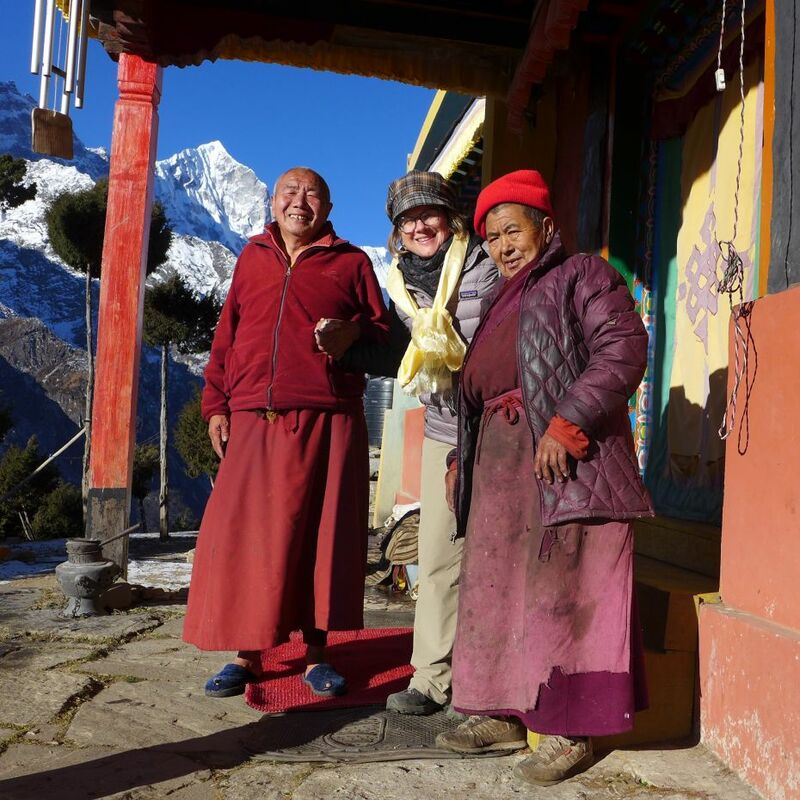 The author thanks Effie Fletcher at Himalayan High Treks and Dharma Journeys Pilgrimages, and Amber Tamang at Three Jewels Adventures for their help with arrangements for the trek. FPMT.org brings you news of Lama Zopa Rinpoche and of activities, teachings and events from over 160 FPMT centers, projects and services around the globe. If you like what you read, consider becoming a Friend of FPMT, which supports our work. Real happiness in life starts when you begin to cherish others.